On Thursday, the archdiocese of Baltimore's website said the pope had ordered the archbishop to investigate allegations of sexual harassment of adults by Bransfield. 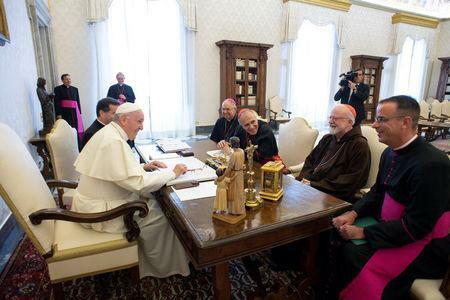 The announcement of Bransfield's resignation came while the pope was meeting Cardinal Daniel DiNardo, president of the U.S. Conference of Catholic Bishops (USCCB), Cardinal Sean O'Malley of Boston, and Archbishop José Horacio Gómez of Los Angeles. In a statement afterwards, DiNardo said they told the pope of "our situation in the United States -- how the Body of Christ is lacerated by the evil of sexual abuse." He called the meeting "a lengthy, fruitful, and good exchange". McCarrick has said that he had "absolutely no recollection" of the alleged abuse of the teenager but has not commented on the other allegations against him. DiNardo has called for the Vatican to launch an investigation, known as an "apostolic visitation," into how McCarrick could have risen steadily through the ranks of the U.S. Church although many people knew that he had engaged for years in sexual misconduct with adult male seminarians.